This week will be a busy week as ever for us here at the Foundation, particularly for our Community Coaches as the academic year kicks off and training begins. As well as this, Health Officer Danny Doherty, fresh from a week on the Health Bus, touring Salford has a busy week ahead, Complimenting Neil Blackburn’s Tackle Unemployment activity, Danny will be joining the course this week to discuss how maintaining health and a healthy lifestyle contribute towards a successful professional life. Danny will also be spending time in the Stoptober Stop Smoking Drop-In centre in Salford precinct, so will hopefully see some of the smokers among you there. Manchester Community Coach Andy Connaughton will be picking up the paces of the St Peter, St Annes, St Richards and St Willibrorough teams, as well as continuing the ongoing progression of the East Manchester Raiders as their season draws to a close. With a Year 9 competition at Hindley on Wednesday and a Year 8 competition at Stretford on Thursday, the battle to continue the development of successful youth Rugby League continues this week. A full week for Andy gets ‘bagged up’ on Sunday, as he supports the East Manchester Raiders in a fund raising exercise by bagging groceries at Tesco in Gorton. Andy hopes to see many Gorton Reds there and we’re sure you’ll dig deep to help fund this community team, helping them along the way. Trafford Community Coach Danny Barton is predominantly Stretford based this week, lending his expertise coaching the Stretford High team, with further coaching of Salford Uni and a Davyhulme Youth tester session scheduled in for Wednesday and Tuesday. Thursday sees Danny providing coaching and functional support at the Manchester Trafford Cup, a Rugby League tournament for Year 8’s taking place at Stretford High School. As you can see, it’s a full week on the books here, without even mentioning Neil Blackburn’s continuing Tackle Unemployment Activity, as well as the work of Salford Outreach Officer Lewis Lockett. We hope you have the opportunity to see us along the way, and have a good week yourselves. 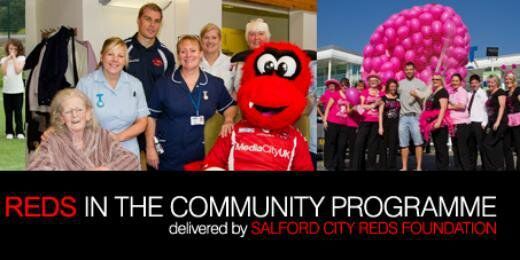 For more information on any SRDFoundation activity, or to let us know about Rugby League in your week, why not visit us at our new Facebook and Twitter pages – (Facebook) Salford Red Devils Foundation and @SRDFoundation on Twitter.